I wasn't sure if the original Philips Hue lights were a gimmick or not, so a year ago I bought the starter pack. They were kind of gimmicky, except for one purpose. In the winter, I have the bedroom Hue light set to gradually come on starting around 6:45am. I set the color to a nice daylight temperature to simulate the sun rising. It's a great way to wake up in the morning. The other two bulbs that come in the starter pack are in my family room, and are set on timers. At 5pm, they come on with an energizing white temperature. At 7pm, they dim and the color temperature warms up a bit. At 10pm, they shut off, telling me it's time to go to bed. When the family room lights shut off, the bedroom light comes on dim and red. 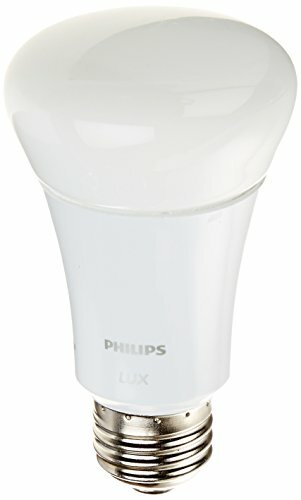 I wanted to add Hue lights to all the fixtures in my house, but at $60/bulb, I really couldn't justify the expense. Then I found the Philips Lux bulbs. The Lux bulbs have the same WiFi connection, but don't change colors. They can be set on timers just like the original Hue bulbs, so they can be part of my daily lighting schedule. I ordered a couple of them--one for the living room, and one for the office. Since the Lux bulbs don't change color, they can't be used in the Hue Light Recipes (Relax, Concentrate, Energize, Reading.) Just basic on/off recipes. Of course, all can be tied to IFTTT for even more automation. And all can be turned on/off when I'm not at home via the Hue app. They're a great tool to use when you're on vacation--set the schedule and people will think someone is still home. At the time of writing, the Hue Lux bulbs are $20 on Amazon. Much more budget-friendly than the $60 color-changing Hue bulbs. They're LED, so power consumption is minimal. You'll need to get a starter pack to begin, since it includes the WiFi bridge necessary to control the lights. More info on the Philips Hue lighting family.